Obituary for Magdalena "Maggie" P Zamora | Fletcher Funeral & Cremation Services, P.A. 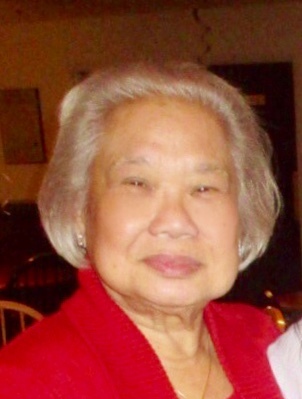 Magdalena “Maggie” Pascual Zamora, 84, of Westminster, passed away peacefully on March 31, 2019, at Carroll Hospital Center in Westminster, MD with her family by her side. Maggie was born October 10, 1934, in Bulacan, Philippines and immigrated to the United States in 1969. She was one of the kindest people you could ever meet and was the most selfless person putting everyone’s needs in front of her own. She was a fantastic cook, and it was a complete joy to her to open her home to friends and family to feed them. She loved socializing, enjoyed going to casino with friends, and had a wonderful smile that could light up a room. She was a member of St. John Catholic Church. She is survived by her husband of 55 years, Ernesto, four children, Armando Zamora (Beth), Myra Lastner (Ric), Olive Brooks (Stephen), and Ron Zamora (Carolyn), and eight grandchildren, Trevor, Tyler, Miranda, MacKenzie, Carter, Jonathan, Jamie, and Madison. A Memorial Mass will be held on Wednesday, April 3, 2019 at 10:30 a.m. at St. John Catholic Church, 43 Monroe Street, Westminster, MD with visitation from 10 to 10:30 a.m. at the church. Inurnment will follow in Evergreen Memorial Gardens in Finksburg. In lieu of flowers, memorial contributions may be made in her name to The Cerebral Palsy Foundation at www.yourcpf.org. or mail to 3 Columbus Circle, 15th Floor, New York, New York 10019.